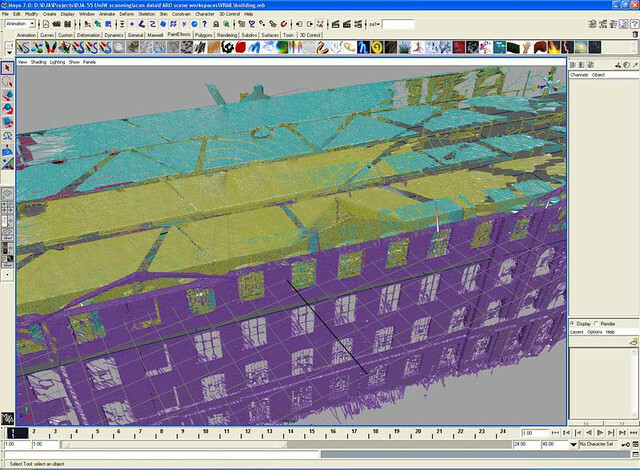 Geospatial Survey Solutions Ltd (GSS) and Deri Jones & Associates Ltd (DJA) were approached by the University of Wolverhampton and main contractors Frank Galliers Ltd, to capture 3D laser scanning data and construct a virtual interior of the existing building as it stands. Situated in the village of Upper Tean, Staffordshire, England, Tean Mill was once the largest tape mill in Europe, producing a variety of fabric tapes - from the webbing for soldiers in the First World War via parachute straps for the Second World War to seatbelts for cars in the 1970's. Production came to an end in the mid 1980's and the mill has been in a state of dereliction since then. Based around the original structure of Tean Hall, the site has a variety of interconnecting buildings covering a 500 year period and offers a fascinating insight to the progress of the industrial revolution. A listed building, it is currently undergoing redevelopment as apartments and housing, bringing it back to its rightful position as the centrepiece of the village. The first section of the mill to be recorded was the main mill. Dating from the 1870's, this consisted of four large floors. Originally powered by steam, with a system of drive shafts, belts and pulleys distributing the power throughout the building, the building had lain unused since 1986 and had no source of electricity. 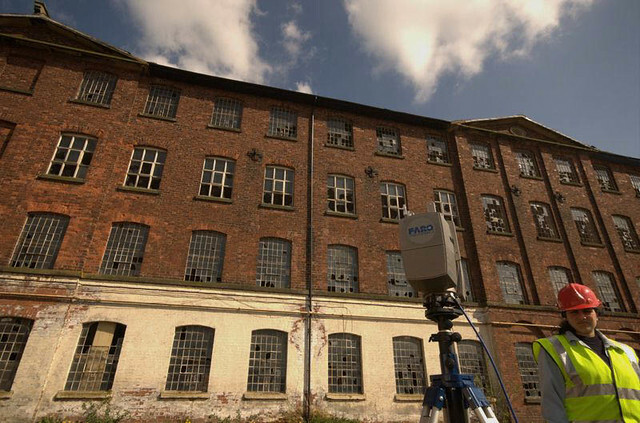 Each floor of the mill was recorded using the LS880 with many cast iron support pillars creating visibility problems, the wheeled tripod and battery pack allowed us to quickly capture several viewpoints on each floor and build an accurate model. 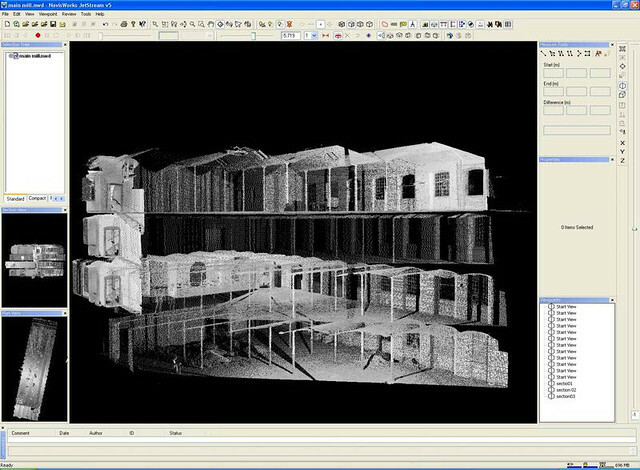 During the one day on site, a total of 16 high resolution scans were captured, over a four story building with only battery power available - the relatively light weight and portability of the scanner being appreciated by the operators! DJA returned a month later to capture another section of the mill. This time, part of the old hall was the target, with a different set of challenges. Another sixteen full colour scans were captured in a continuous session. Working in the maze of small rooms that typify a 17th Century building, the scanner was moved from room to room, capturing all the detail of the structure -the layers of changes made over time and the detail of the carpentry in areas such as the oak panelled room. With only minimal lighting available in the rooms, photographs reveal little detail, but the self illuminating nature of the infrared laser exposes a wealth of other details. Back at the office, the data was processed and registered to provide a combined survey of the ground floor rooms in the old hall and the cross mill - an extension added in the late 18th century to the original mill adjoining the hall. Identification of "lost"' rooms: in such an old and much altered building, bricked up spaces, old doors and large fireplaces can become lost. 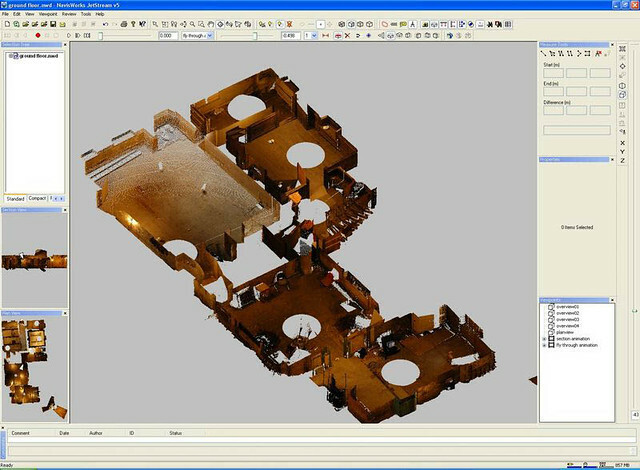 The ability to look at the structure of the building in 3D allows the resolution of these spaces and link up identifiable structure in different rooms. Analysis of infrared reflection data: The scanner records at a different wavelength to what we see or a camera records. This can sometimes be used to advantage to pick up on detail that is not immediately obvious such as highlighting paintings, plastered over doorways, different varieties of brickwork etc.